Product and service: very good! Delivery: on time! Product quality: played 18 holes without any problem! Great battery. Haven't played 36 holes with it yet, but just completed 18 holes today in some of the heaviest,muddiest conditions I've played in for over a year. Trolley still pulling easily at the end. Very pleased! Excellent service, I had a problem with the first battery I purchased but this was resolved very quickly and without any quibbles. Good company to deal with. Arrived as expected. Everything OK. Had a question that was answered promptly Have yet to use battery on my trolley so cant comment about reliability or education. If all goes well a good supplier and at a very good price. The battery is good for a Powakaddy Freeway trolley as the length and width suit the battery tray unlike the more modern 26ah which are more squat. The T-Bar adaptor is a big disappointment as it is too flimsy, the screws cannot be fitted unless you have a socket set or box spanner and the holes should have covers so children can not stick their fingers in. Satisfied with product so far. Only used it twice. Design of carrying handle could be stronger and more substantial. Service good. Staff exceedingly helpful. This was a first class service for which I thank the Company. This was purchased as a replacement for a 36 hole Powacaddy battery, it was delivered promptly and is a good fit in the original Powacaddy battery bag etc. Requires the t - fitment to be fitted onto battery terminals prior to charging this is easily done using hand tools. 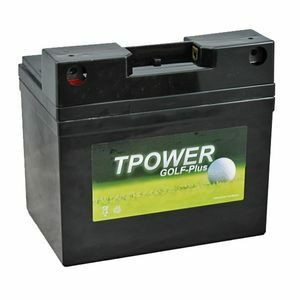 As it is winter I have only used a couple of times since receipt but charges up and works as expected on golf trolley. Brilliant product would surely recommend fast delivery service and up to date info regarding tracking 5 star ??????????????????? ?